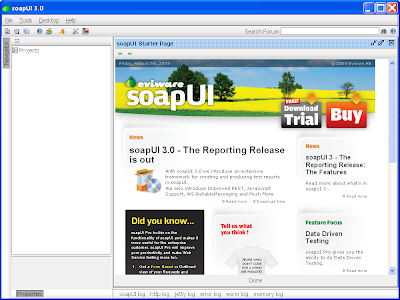 A popular tool for web service testing is SoapUI. 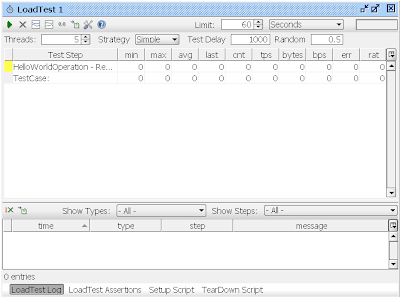 The following blog post describes how to use it for testing a simple web service, as well as setting up a series of tests and even load/stress testing. Without a doubt similar documentation is available on the SoapUI website; my post gives my spin on the product that maybe useful to others. 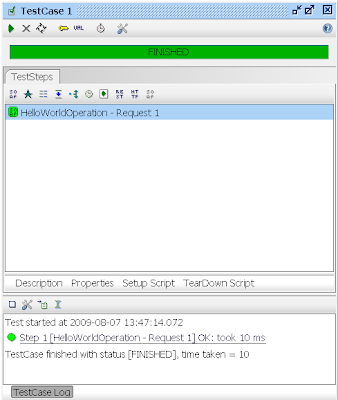 The inputElement and the outputElement will constitute the incoming and outgoing payloads of a simple HelloWorld web service. Note in the left navigator the Projects node. 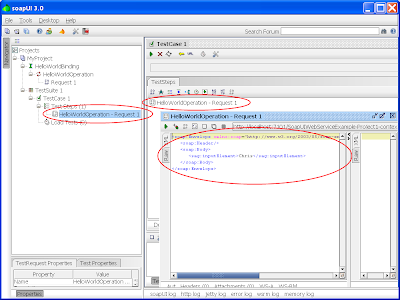 Right click on the Projects node and select New soapUI Project from the context menu. 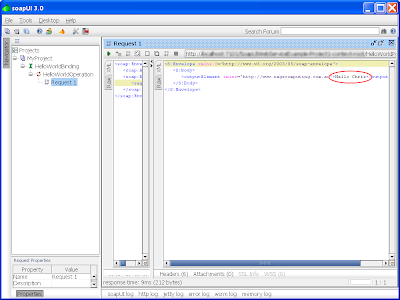 This will display the New soapUI Project dialog. Leave the default check boxes, where Create Requests is checked, and the rest unchecked. 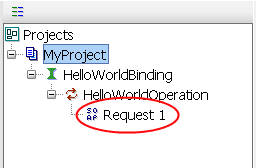 Note how SoapUI has created the project, a node to represent the WSDL binding, a node to represent the WSDL operations (one in this case), and a dummy request. 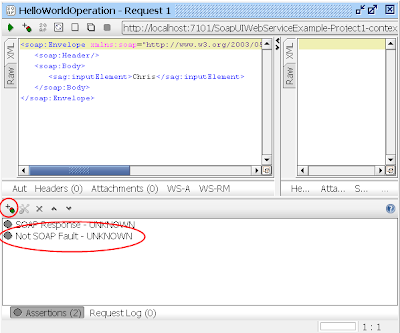 The beauty of SoapUI is its taken care of virtually everything but the actual data values for you. Network communications, formation of the SOAP payloads, and even validating the XML structures. For the developer this is a boon as you can test one of your web services to see what's happening without writing any client side code. 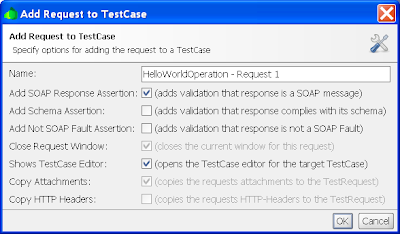 The previous steps were good for one of adlibbed tests on our web service, but what if you wanted to create a series of tests, replay them, and add assertions based around the results? 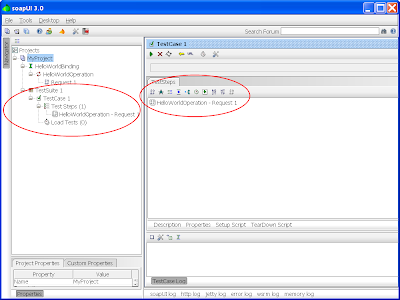 SoapUI offers the Test Suite. 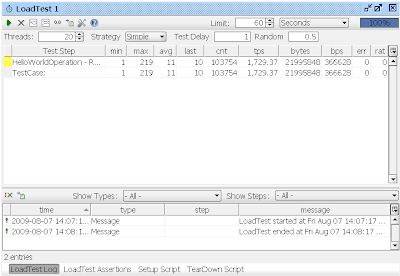 Load and stress testing are an integral part of ensuring your application will work on hitting productions. 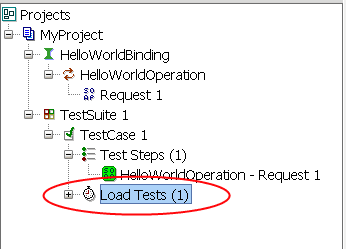 Strictly speaking load and stress testing are proving different things, but for the remainder of this post I'll assume they're one and the same as they use the same facilities in SoapUI. In the above picture you can see that the web service is being called multiple times. The process bar tells you the percentage completeness of the tests. The Limit field is the number of seconds the test will run for. 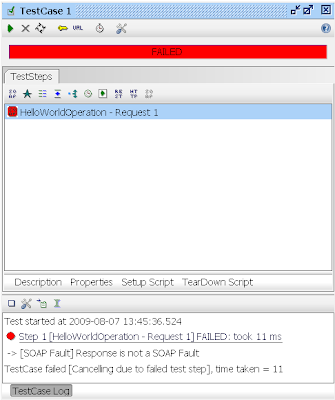 The Threads is the number of threads (essentially simulated users) that SoapUI will spawn to send requests to the web service. 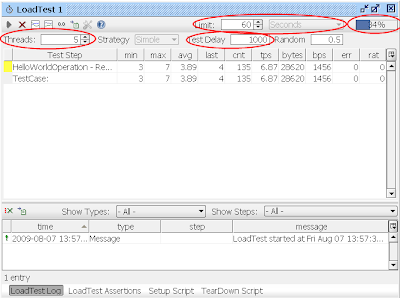 Finally the Test Delay is the milliseconds between each response and next requests. 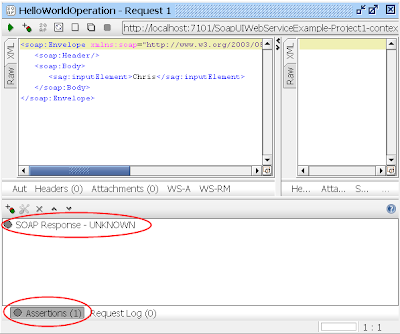 Min and max shows you how fast and how slow your web service could process a request and send a response. Typically your worst time is on startup as the server initializes the web services. 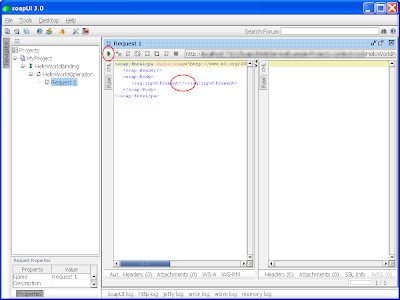 Err – number of errors detected such as SOAP Faults. (Nice bit about this screenshot is we're using an Oracle WebLogic Server behind the scenes, a fairly expensive server all round, but it certainly cranks along with this simplistic test case). Thanx for the article.. I must admit, it helped me alot. Can you please guide us...as how to export the report as well as the statistics graph... theres an icon there to click on, but its not export the file in a presentable manner. 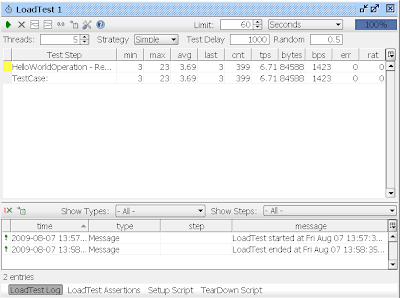 can you please explain a bit more about the functions on the Load test window..like we have "Threads" means the number of users using and "Total Runs" means the number of times the webservice will execute. like if I need to explain the result report to client, i am not myself sure about the terminologies. To be blunt, no. I have a life and family that takes priority over dropping everything for someone purely because they say it's "Urgent". "Urgent" is your pickle, not mine. ...expecting some random blogger to answer your call seems less than an ideal solution to solving your "Urgent" request. This blog is now CLOSED. You can find my new blog here. All future comments will be blocked.